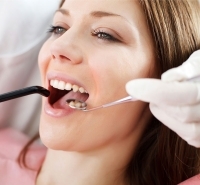 Your Reflections Dental Health dentists in Winnipeg offer laser dental services to help treat your smile. LASER stands for Light Amplification by Simulated Emission of Radiation and if you think of it as a single wavelength beam of highly concentrated light energy – you're right on target. Laser light is extremely efficient and produces very little heat as it acts on its target. This makes it ideal for oral surgery since it rarely affects tissues other than those it targets. The laser provides precise control while simultaneously minimizes bleeding and sterilizes the treatment area. Best of all, a laser may eliminate the need to use a drill or even administer anesthesia in some procedures that can all add up to a more relaxed experience. To learn more about our laser procedures please contact us today! Want to reveal a perfect smile? Aesthetic tissue contouring may be right for you.